Tommy Stinson surprised many earlier this year by resurrecting his old band (or the moniker at least), Bash & Pop to put out a new full LP of tracks. The result was “Anything Could Happen,” a dozen down and dirty straight up rock songs that hues pretty close to The Replacements, the band that started it all for Tommy. 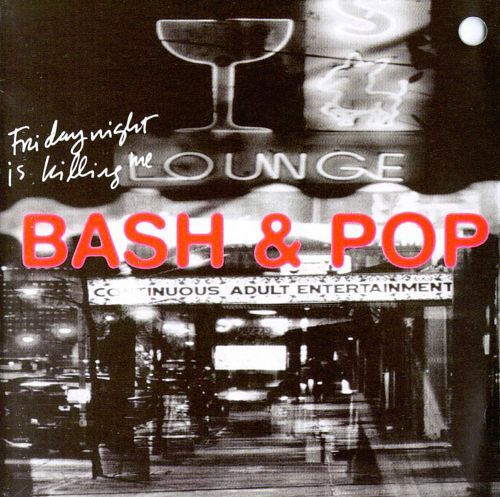 The surprises keep coming as Stinson, partnering with the label Omnivore, just re-released Bash & Pop’s 1993 debut, “Friday Night Is Killing Me,” with a phenomenal 18 bonus tracks. Hardly throw-aways, even his home demos here, of which there are four, sound like fully formed rockers that could have easily been released as is (“the stellar “Hang Ups,” in particular). There is also a slew of alternate takes, and a number of songs that never made the record, like “Making Me Sick” (that eventually found a home on on the Clerks soundtrack) and “Harboring a Fugitive,” two songs as good as anything from the original debut. For Replacement disiples, the reissue was co-produced by Peter Jesperson, the band’s former manager and the label co-founder (Twin/Tone) who gave the band their original break. The reissue also includes an essay in the linear notes from Bob Mehr, the author behind the authoritative Replacements bio Trouble Boys.